Links to: Feudatory States, Convention States. Imperforate, watermark 37 (Coat of Arms), lithography. Printed by the Survey Office in Calcutta. April 1, 1854. Not issued. The Half Anna Vermilion and Deep Vermilion of 1854 were prepared but not officially placed in use. Only 360 stamps were not destroyed of a much larger printing. The ½ anna blue, die III, was printed between July 3 and August 25, 1855. It is therefore obvious that it could not have been issued earlier than those dates. Of the 1 anna red, die III, many were later destroyed but the exact number is unknown. The 2 anna green was made by typography from copper cliches. 7 million were printed but around 3 million were later destroyed. Several different watermarks appear among these stamps. The most common features the arms of the Honourable East India Company. Thank you to Floyd Conaway for help with the issue dates and quantities. Mr. Conaway also provided the literature references. Thank you to Rohan Khurana for the nice images and for additional help on the dates and quantities. Mr. Conaway also provided this piece of insight: "These stamps were issued following a Commission of Inquiry, from which Act XVII of 1854 was passed, which established the Indian Post Office. The East India Company's posts are important, because the "Great Company" held sway over so much of the world's commerce in those days, extending across Asia and East Africa. It had its own armies and its own postal service; constructed railways and public works; and acted like an imperial force long before the Empire was established." Smythies and Martin, The Half Anna Lithographed Stamps of India, 1854-55: London, 1927. 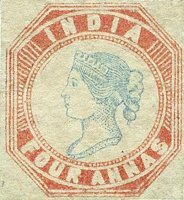 Martin and Smythies, The Four Annas Lithographed Stamps of India, 1854-55: London, Philatelic Society of India and Stanley Gibbons Ltd., 1930. 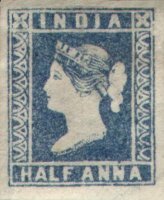 One Anna & Two Anna Postage Stamps of India 1854-55 by Mr. L.E.Dawson. 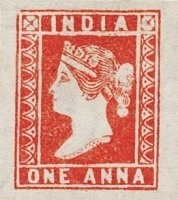 The first stamps issued in India were the so called Scinde Dawks. See also the Feudatory and Convention States. This page has been extended to show later phases of India's postal history. For 1860 Scott lists an Sc19C on bluish paper. This is SG51 in Gibbons. On changes of administration, in 1858, Gibbons  notes, 'Queen Victoria assumed the government of the territories in India "heretofore administered in trust by the Honourable East India Company"'. They describe this as the Crown Colony period and from 1877, when Victoria assumed the title Empress of India as the Empire period. 1947 saw the Dominion period, leading to the Republic in 1950.